After texting with some friends and fellow organizers, I wrote the number provided by the National Lawyers’ Guild on my forearm and left my house. I didn’t know what to expect, though I suspected that eventually I’d be in a cat-and-mouse march with the cops—this seemed to be the hegemonic form of late-night protest these past weeks. I immediately found people I knew when I arrived, walking south on Broadway from Fulton. That night it sometimes felt like a fifth or a quarter of the several hundred protestors came from the organizing groups of NYU, CUNY and the New School—hardly a mass base. The cops had timed their eviction well. Hundreds of us were pushed north from the park by groups of police; after a lot of kettling and jostling, we took the streets and marched to Foley Square. But when vans stuffed with riot cops arrived, we ended up splitting despite a tense cacophony of mic checks. Some wanted to march to evade cops, others to hold the space. I joined the marchers up to Houston, then returned to Foley Square where others had stayed behind and begun a General Assembly. Eventually, most of those who got as far as north as 14th street turned back, some returning to Foley, others joining a group that had held the intersection at Pine and Broadway since just past midnight. I ran into a bunch of them there between five and six in the morning. It was dispiriting to see people divided when the marchers split at Foley. Large numbers of new activists in the movement seemed to diminish intra-left tensions. In the absence of large numbers, though, old habits reasserted themselves. Still, in the small hours of Tuesday morning, these divisions were hardly catastrophic. Meanwhile, I witnessed police harassing, provoking, and at times attacking those who had kept marching. One tactic was to assault or arrest someone in a crowd to try to instigate other activists to react with violence. Another was to target for arrest obvious leaders who were running up and down the crowd giving guidance. Protestors were restrained—most had been through this before and learned to enjoy the rules’ game-like regularity. (Many cops probably enjoy this too, though I’m sure others hate this part of their work.) Protestors new to this kind of action seemed disoriented by its apparent randomness, often asking questions like “What is the point of this, again?” — sometimes speaking to their friends, sometimes to no one at all. One by one many drifted away from the march. Every experienced activist knows that it can be helpful to provoke cops into acting brutally on camera, but very few actually do this. Most of the media and most of their consumers, however, exaggerate this truth out of all proportion, believing that nearly all activists are almost always out to provoke for the camera. This distortion helps the police, who often plant provocateurs among protestors to rile up crowds and make them look bad. The police also try to incite violence by other means. 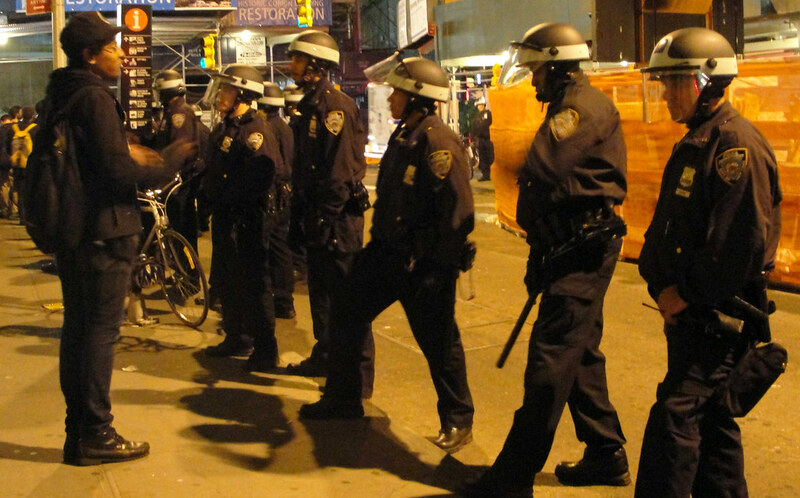 In the OWS marches I’ve been at, they use an accumulation of apparently disjointed or random acts of aggression which make little impression on camera—like targeted arrests, shoving, petty rule enforcement (like screaming at people — including cyclists! — to stay on the sidewalk at 3 am in deserted streets). I imagine that they do this first to make protesting a very hard-to-acquire taste except for those with enough experience of the right kind of personality, and second to create incidents that justify often violent arrests. A successful protest is a euphoric experience, and such police tactics seem ideally suited to destroying an average person’s willingness to engage in collective action. A more subtle strategy is the police’s use of the camouflage of the obvious to hide their violence in plain site. They dress now in such bulkily armored uniforms that their bodies dwarf protestors’; and when carrying huge futuristic rifles or riding scooters which they use to push people around, they deploy an extraordinary threat. Subtle because this ostentatious show of force is perpetually being normalized not just by the association of police with the state and “public order”—especially in this post-9/11 era of “security culture”—but also the incremental pace of police’s incorporation of new weapons and new techniques. The most fear-inspiring threats tend to fade to background, though, since they’re rarely used as the direct instruments of violence. This is what makes them powerful. So we’re shocked when we see cops swinging billy clubs or spraying mace, as they have for decades. But the police’s atavistic instincts and hand-to-hand engagements are probably among their less effective weapons for the control of public space. Certainly these are the things most likely to embarrass them on TV (or at least YouTube). On Tuesday afternoon, at Zuccotti Park, the upbeat and syncretic OWS spirit of old was back. Of course faces were drawn while in a room somewhere a judge determined the the encampment’s fate — at least for the next few hours. It was calm enough for me to write down what I saw. I found people commenting on the fact that cops were holding the park, surrounded by protesters. “Can we make a citizens’ arrest of the police?” one passerby asked. “The cops are occupying!” another exclaimed. One woman carried a placard, still bearing its price sticker, with Police State scrawled in thin marker. A bored ABC reporter sucked on a red lollypop. A policeman joked to a protestor that he (the cop) would be the last to find out about his orders. “I don’t have a blackberry like you guys,” he said to a laugh. Smiles faded as he blocked people’s path however — they would have to turn around and walk three blocks to advance four yards to a micro-sized rally. It was a reminder of how small the stakes of most individual police assertions of power have been. That night, when I returned for the General Assembly, cops were keeping some people from entering the park with bags. Most of those were people of color. A reminder that petty assertions of power are in fact a foundation of policing practices, the ultimate example of which is probably the “stop and frisk” campaign, which overwhelmingly targets Blacks and Latinos—at a huge scale and with devastating effects.